Presidential Environmental Youth Award - each year the PEYA program honors a wide variety of projects developed by young individuals, school classes, summer camps, public interest groups, and youth organizations to promote environmental awareness. Recycle Bowl – sponsored by Keep America Beautiful, this friendly competition aims to establish school recycling programs or improve school recycling rates. Winners receive gift certificates to purchase recycling bins. Recycle Rally - a nationwide school recycling program designed to raise student awareness about the importance of recycling and to inspire them to make recycling a part of their daily lives. Through the program, schools may have the opportunity to win prizes, set and achieve recycling goals, utilize effective educational tools, and connect with a national school recycling network. Solar Car Challenge - helps motivate students in science and engineering, and to increase alternative energy awareness. The Challenge teaches high school students around the world how to build roadworthy solar cars. Texas Garden Clubs Essay & Speech Contests – these contests are designed to promote horticulture and a love of gardening, conservation, sustainability, and environmental stewardship. Cash prizes are awarded. eCYBERMISSION - a web-based Science, Technology, Engineering and Mathematics team competition. Each team will propose a solution to a real problem in their community and compete for state, regional, and national awards. Texas Envirothon – a five member team competition where students work together to answer knowledge-based questions in outdoor field-testing stations and also apply that knowledge to solve real-life problems. Texas winners advance to the national competition. 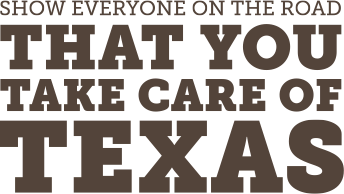 Don’t mess with Texas Scholarships – essay contest for high school seniors. Scholarship recognizes the achievements of students who have taken leadership roles to prevent litter in their schools and/or communities and build awareness of the Don’t mess with Texas initiative.